Match of the day -- Top-seeded Serena Williams staged another of her patented comebacks, defeating No. 27 Victoria "Station" Azarenka 3-6, 6-4, 6-2 in the third round. Williams, seeking her third French Open singles title, trailed 6-3, 4-2 but won the last four games of the second set and the last six games of the third set. Upset of the day -- Jeremy "Don't Be" Chardy of France knocked off his second consecutive seed, clobbering No. 17 David "Gerry" Goffin of Belgium 6-3, 6-4, 6-2. Chardy, who also took out No. 16 John Isner, will face No. 3 Andy "Bill" Murray in the round of 16.
Notable -- No. 17 seed Sara "No Runs, No Hits, No" Errani, the 2012 runner-up to Maria Sharapova, dispatched No. 10 Andrea Petkovic "Park," a 2014 semifinalist, 6-3, 6-3. Men's seeded winners -- No. 1 Novak Djokovic, No. 3 Murray, No. 6 Rafael Nadal (nine-time champion, including last five years), No. 7 David Ferrer, No. 9 Marin "County" Cilic, No. 20 Richard "Blow A" Gasquet. Men's seeded losers -- No. 15 Kevin Anderson, No. 17 David Goffin, No. 23 Leonardo "Da Vinci" Mayer, No. 29 Nick Kyrgios. Women's seeded winners -- No. 1 Williams, No. 4 Petra Kvitova, No. 17 Errani, No. 23 Timea Bacsinszky. Women's seeded losers -- No. 10 Petkovic, No. 16 Madison "Avenue" Keys, No. 27 Azarenka, No. 30 Irina-Camelia "Ain't Too Proud To" Begu. Stars and stripes -- Sloane "Ranger" Stephens joined Williams in the round of 16, but Keys and Irina "Atlanta" Falconi lost. Jack Sock reached the fourth round of a major for the first time, dominating 18-year-old sensation Borna "Gain Christian" Coric of Croatia 6-2, 6-1, 6-4. Coric owns victories over Nadal and Murray. Bethanie Mattek-Sands and Lucie Safarova, the seventh seeds in women's doubles and reigning Australian Open champions, advanced to the third round. Northern California connection -- Hao-Ching Chan of Taiwan and Spain's Anabel Medina Garrigues, a member of the Sacramento-based California Dream in World TeamTennis, reached the last 16 in women's doubles. Mattek-Sands and former Stanford star Mike Bryan, seeded second in mixed doubles, won in the second round, but Raquel "Welch" Kops-Jones, a San Jose resident and ex-Cal standout, and Robert Farah of Colombia lost. Fast facts -- Williams became the first woman in the Open era, which began in 1968, to win at least 50 singles matches in each Grand Slam tournament. A whopping five Frenchmen, including four seeds, reached the round of 16: No. 12 Gilles Simon, No. 13 Gael Monfils, No. 14 Jo-Wilfried Tsonga, No. 20 Gasquet and Chardy. A Romanian woman advanced to the last 16, but not Simona "I Need" Halep. Andreea Mitu eliminated 34-year-old Francesca Schiavone, the 2010 champion, 7-5, 6-4. Halep, the No. 3 seed and 2014 runner-up, lost to Mirjana Lucic-Baroni in the second round. Quote -- Azarenka on chair umpire Kader Nouni's decision to replay a key point: "That call was (bull----), and everybody knows it." Today's best match -- Second-seeded Roger Federer, the 2009 French Open champion, is scheduled to face Monfils, a 2008 semifinalist and a three-time quarterfinalist at Roland Garros, in the round of 16 (NBC, 9 a.m. PDT). However, rain is forecast. Monfils has won the last two meetings against Federer, both on clay. And this time, Monfils will be playing in his home country. Upset of the day -- No. 28 seed Flavia Pennetta, a 33-year-old Italian, dismissed No. 8 Carla Suarez Navarro of Spain 6-3, 6-4 in the third round. Pennetta had lost in the first round of her two previous tournaments, to 10th-ranked Andrea Petkovic in Madrid and then-No. 19 Elina Svitolina in Rome. Pennetta has never advanced past the fourth round of the French Open in 12 appearances. Match of the day -- No. 29 seed Alize Cornet of France reached the fourth round at Roland Garros for the first time in 11 appearances, beating Mirjana Lucic-Baroni of Croatia 4-6, 6-3, 7-5. The 25-year-old Cornet "celebrated as if she had won the tournament, falling onto her back, letting out a scream and then bursting into tears," the Associated Press reported. Notable -- No. 2 seed and defending champion Maria Sharapova ended No. 26 Samantha Stosur's winning streak at seven matches with a 6-3, 6-4 victory. Stosur, the 2010 runner-up to Francesca Schiavone, had lost only five games in two matches in Paris. 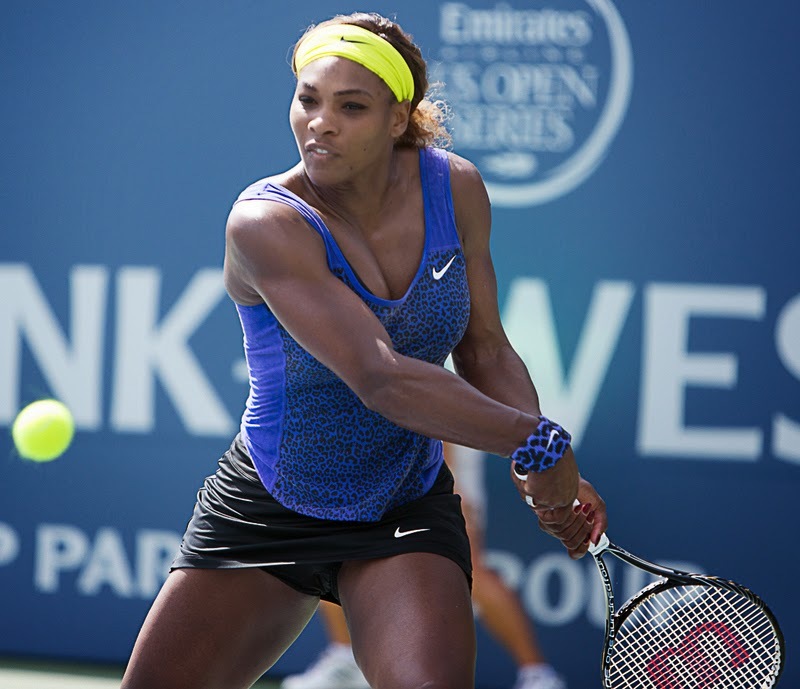 Top-seeded Serena Williams is scheduled to face No. 27 Victoria Azarenka today in the third round. Williams saved three match points in a 7-6 (5), 3-6, 7-6 (1) victory over Azarenka in the third round at Madrid three weeks ago. Men's seeded winners -- No. 2 Roger Federer (2009 champion), No. 4 Tomas Berdych, No. 8 Stan Wawrinka, No. 12 Gilles Simon, No. 13 Gael Monfils, No. 14 Jo-Wilfried Tsonga, No. 20 Richard "Blow A" Gasquet. Men's seeded loser -- No. 21 Pablo "Jose" Cuevas. Women's seeded winners -- No. 2 Sharapova (2012 and 2014 champion), No. 7 Ana Ivanovic (2008 champion), No. 9 Ekaterina Makarova, No. 13 Lucie Safarova, No. 19 Svitolina, No. 21 Garbine Muguruza, No. 28 Pennetta, No. 29 Cornet. Women's seeded losers -- No. 8 Suarez Navarro, No. 11 Angelique Kerber, No. 20 Sabine Lisicki, No. 26 Stosur. Stars and stripes -- Steve Johnson lost to Wawrinka 6-4, 6-3, 6-2, leaving Jack Sock as the only U.S. man left in singles. Sock, 22, is set to play Borna Coric, 18, of Croatia today in the third round, with the winner likely to meet Rafael Nadal -- who has won nine French Open singles titles, including the last five -- in the round of 16. Top-seeded Bob and Mike Bryan and second-seeded Vasek Pospisil of Canada and Sock reached the third round of men's doubles. However, left-handers Austin Krajicek and Donald Young lost to ninth-seeded Rohan Bopanna of India and Florin Mergea of Romania 3-6, 6-3, 7-5. Fast facts -- Only four of the top eight women's seeds remain halfway through the third round: No. 1 Williams, No. 2 Sharapova, No. 4 Petra Kvitova and No. 7 Ivanovic. In contrast, all of the top nine men's seeds are still alive. Northern California connection -- In addition to the Bryans, former Stanford stars, advancing in men's doubles, Abigail Spears and Scott Lipsky, another ex-Cardinal, won their first-round mixed doubles match. But fifth-seeded Bob Bryan and Caroline Garcia of France lost to Andreja Klepac of Slovenia and Rajeev Ram of Carmel, Ind., 3-6, 7-5 [10-8]. Quote -- Cornet: "At last, I'm into the second week at Roland. I've been waiting for this for 11 years." Upset of the day -- Fifth-seeded "Sweet" Caroline Wozniacki's struggles in the French Open continued as the former world No. 1 fell to Julia Goerges of Germany 6-4, 7-6 (4) in the second round in the latest women's upset. Wozniacki has advanced past the third round at Roland Garros only once in nine appearances, reaching the quarterfinals in 2010. After two rounds, three of the top six women's singles seeds and 12 of the 32 have been eliminated. Heading the list are No. 3 and 2014 runner-up Simona "I Need Some" Halep, No. 5 Wozniacki and No. 6 Eugenie "In A Bottle" Bouchard. Match of the day -- In a battle of past French Open champions, 34-year-old Francesca Schiavone saved a match point in her 6-7 (11), 7-5, 10-8 victory over 18th-seeded Svetlana Kuznetsova. At 3 hours, 50 minutes, it was the third-longest women's singles match at Roland Garros in the Open era, which began in 1968. Schiavone also beat Kuznetsova in the longest Grand Slam women's match in history, 6-4, 1-6, 16-14 in the round of 16 at the 2011 Australian Open. Notable -- Both No. 1 seeds had physical problems in their victories. Novak Djokovic was treated for a hip injury during his straight-set win over Gilles Muller. "It's nothing serious, really," Djokovic said. Serena Williams' right elbow, which led her to withdraw from her second-round match in the Italian Open this month, bothered her during her 5-7, 6-3, 6-3 triumph over Anna-Lena Friedsam of Germany. Williams next plays 27th-seeded Victoria Azarenka, a former world No. 1 and two-time Australian Open champion. Men's seeded winners -- No. 1 Djokovic, No. 3 Andy Murray, No. 5 Kei Nishikori (walkover), No. 6 Rafael Nadal (nine-time champion, including last five years), No. 7 David Ferrer, No. 9 Marin "County" Cilic, No. 15 Kevin Anderson, No. 17 David Goffin, No. 23 Leonardo "Da Vinci" Mayer, No. 29 Nick Kyrgios (walkover). Men's seeded losers -- No. 16 John Isner, No. 18 Tommy Robredo, No. 22 Philipp Kohlschreiber, No. 27 Bernard "A." Tomic, No. 31 Viktor Troicki. Women's seeded winners -- No. 1 Williams (2002, 2013 champion), No. 4 Petra Kvitova, No. 10 Andrea Petkovic, No. 16 Madison "Avenue" Keys, No. 17 Sara Errani, No. 23 Timea Bacsinszky, No. 27 Azarenka, No. 30 Irina-Camelia "Ain't Too Proud To" Begu. Women's seeded losers -- No. 5 Wozniacki, No. 12 Karolina Pliskova, No. 18 Svetlana Kuznetsova (2009 champion), No. 32 Zarina "Williams" Diyas. Stars and stripes -- After two rounds of singles, only two of seven U.S. men remain (Jack Sock and Steve Johnson), and four of 17 American women are left (No. 1 Williams, No. 16 Keys, Sloane "Ranger" Stephens and Irina "Atlanta" Falconi -- all in the top half of the draw). Advancing to the second round in women's doubles were No. 7 seeds and reigning Australian Open champions Bethanie Mattek-Sands of Phoenix and Lucie Safarova of the Czech Republic. Fast fact -- Two teenagers, Borna Coric (18) of Croatia and Thanasi Kokkinakis (19) of Australia, reached the third round of men's singles. There hadn't been one since 2008. 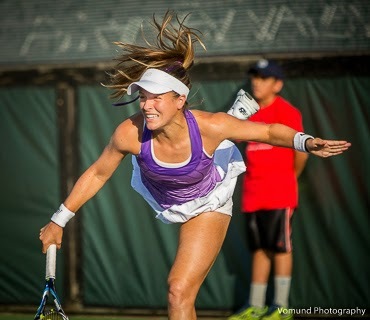 Northern California connection -- Sixth-seeded Raquel Kops-Jones, a San Jose resident and ex-Cal star, and Abigail Spears bowed out of women's doubles in the first round with a 6-1, 6-4 loss to Ysaline Bonaventure of Belgium and Anna Karolina Schmiedlova of Slovakia. Also losing in women's doubles were Jarmila Gajdosova of the new California Dream in World TeamTennis and fellow naturalized Australian Ajla Tomljanovic. Sam Querrey, a San Francisco native and former Sacramento Capital in WTT, and Johnson of Redondo Beach lost to fifth-seeded Jean-Julien Rojer of the Netherlands and Horia Tecau of Romania 6-4, 6-0 in the second round of men's doubles. Winning in the opening round of mixed doubles were second-seeded Mattek-Sands and Mike Bryan (Stanford, Dream), and Anastasia Rodionova and Aisam-Ul-Haq Qureshi (Dream). Quotes -- Djokovic on accidentally letting a long shot by Muller touch his racket before hitting the ground: "Never, never, ever happened. And it should never happen again." Schiavone on Kuznetsova's game: "It's like playing in a mirror." Upset of the day -- Mirjana Lucic-Baroni, a 33-year-old former prodigy from Croatia, continued her resurgence with a 7-5, 6-1 victory over No. 3 seed and 2014 runner-up Simona Halep of Romania in the second round. Lucic-Baroni, who sat out from 2003 through 2009 amid personal problems, also ousted Halep to reach the round of 16 in last year's U.S. Open as a qualifier. Lucic-Baroni has accused her father, Marinko, of physical abuse and tampering with her prize money. "There have been more beatings than anyone can imagine," she once said. Match of the day -- Germany's Benjamin Becker, who will turn 34 on June 16, outlasted 32nd-seeded Fernando Verdasco of Spain 6-4, 0-6, 1-6, 7-5, 10-8.
Notable -- Samantha Stosur, the 26th seed and 2010 runner-up, extended her winning streak to seven matches with a 6-0, 6-1 victory over French wild card Amandine Hesse. Stosur has lost only five games in two matches. Nicolas Mahut, a 33-year-old Frenchman, eliminated No. 24 seed and 2014 semifinalist Ernests Gulbis of Latvia 6-3, 3-6, 7-5, 6-3. Men's seeded winners -- No. 2 Roger Federer, No. 4 Tomas Berdych, No. 5 Kei Nishikori, No. 8 Stan Wawrinka, No. 12 Gilles Simon, No. 13 Gael Monfils, No. 14 Jo-Wilfried Tsonga, No. 21 Pablo Cuevas, No. 22 Philipp Kohlschreiber. Men's seeded losers -- No. 19 Roberto Bautista Agut, No. 24 Gulbis, No. 28 Fabio Fognini, No. 32 Fernando Verdasco. Women's seeded winners -- No. 2 Maria Sharapova, No. 7 Ana Ivanovic, No. 8 Carla Suarez Navarro, No. 9 Ekaterina Makarova, No. 11 Angelique Kerber, No. 13 Lucie Safarova, No. 19 Elina Svitolina, No. 20 Sabine Lisicki, No. 21 Garbine Muguruza, No. 26 Stosur, No. 28 Flavia Pennetta, No. 29 Alize Cornet. Women's seeded loser -- No. 3 Halep. Stars and stripes -- Steve Johnson beat Sergiy Stakhovsky of Ukraine 2-6, 6-3, 7-6 (5), 7-6 (6) to reach the third round of a Grand Slam tournament for the second straight time. Advancing to the second round in doubles were top-seeded Bob and Mike Bryan, second-seeded Jack Sock and Canadian Vasek Pospisil, Austin Krajicek and Donald Young, and Varvara Lepchenko and China's Saisai Zheng. Fast facts -- Kimiko Date-Krumm and Francesca Schiavone, who won their first-round doubles match, are a combined 78 years old. Date-Krumm, 44, reached the singles semifinals at Roland Garros 20 years ago, and Schiavone won the singles title five years ago. Northern California connection -- Four members of the California Dream, the new Sacramento-based franchise in World TeamTennis, played first-round doubles matches. California's Bob and Mike Bryan, seeded first in men's doubles, ended a rare two-match losing streak with a 7-6 (8), 6-2 decision over Raven Klaasen of South Africa and Yen-Hsun Lu of Taiwan. Hao-Ching Chan of Taiwan and the Dream's Anabel Medina Garrigues of Spain outclassed Aleksandra Krunic of Serbia and Lesia Tsurenko of Ukraine 6-3, 6-1. And Gilles Muller of Luxembourg and California's Aisam-Ul-Haq Qureshi of Pakistan lost to Florian Mayer and Frank Moser of Germany 6-3, 4-6, 7-6 (1). In the first round of mixed doubles, Raquel Kops-Jones, a San Jose resident and former Cal star, and Robert Farah of Colombia defeated Anastasia Pavlyuchenkova of Russia and Ivo Karlovic of Croatia 7-6 (4), 6-3. Quote -- Lucic-Baroni: "I feel like I missed my best years, for sure. There is nothing I can do (about it) right now. There is no point of thinking about it too much. Just enjoying right now where I am." Despite reaching the quarterfinals of the NCAA Championships in Waco, Texas, the Stanford women finished outside the top 10 in the national rankings for the first time since at least 1987. The Cardinal (18-6) rose three places to No. 11 in the final rankings, released today. The Cal women (22-4) dropped four notches to No. 7 after losing to Stanford in the NCAA round of 16. Both Stanford and Cal return their top three singles players next season and five of their top six. The Cardinal loses No. 5 Ellen Tsay of Pleasanton, and the Bears lose No. 4 Zsofi Susanyi of Hungary. Susanyi reached the singles round of 16 and doubles final (with Klara Fabikova) in the NCAAs. Tsay advanced to the doubles semifinals with Caroline Doyle of San Francisco. On the men's side, Stanford (18-7) finished No. 20, and Cal (19-9) was No. 26. The final singles and doubles rankings will be released on June 3. Upset of the day -- You could see this one coming. Kristina Mladenovic, playing in her home country, dispatched sixth-seeded Eugenie Bouchard of Canada 6-4, 6-4 in the first round. Mladenovic, a two-time Grand Slam mixed doubles champion, eliminated No. 2 seed and 2011 champion Li Na in the first round of last year's French Open. Bouchard, a semifinalist at Roland Garros last year, has won just one match in her last six events. Notable -- Jack Sock of Tampa, Fla., beat 10th-seeded Grigor Dimitrov of Bulgaria 7-6 (7), 6-2, 6-3. It's the second year in a row that Dimitrov, a Wimbledon semifinalist last year, has lost in the opening round at Roland Garros. He fell to 6-foot-11 (2.11-meter) Ivo Karlovic in 2014. Men's seeded winners -- No. 1 Novak Djokovic, No. 6 Rafael Nadal (nine-time champion, including last five years), No. 7 David Ferrer, No. 9 Marin Cilic, No. 15 Kevin Anderson, No. 16 John Isner, No. 20 Richard Gasquet, No. 23 Leonardo Mayer. Men's seeded losers -- No. 10 Dimitrov. Women's seeded winners -- No. 1 Serena Williams (2002 and 2013 champion), No. 4 Petra Kvitova, No. 5 Caroline Wozniacki, No. 10 Andrea Petkovic, No. 16 Madison Keys, No. 18 Svetlana Kuznetsova (2009 champion), No. 23 Timea Bacsinszky, No. 32 Zarina Diyas. Women's seeded losers -- No. 6 Bouchard, No. 25 Jelena Jankovic. Stars and stripes -- After the first round, three of seven U.S. men remain (No. 16 Isner, Sock and Steve Johnson), and four of 17 American women are left (No. 1 Williams, No. 16 Keys, Sloane Stephens and Irina Falconi -- all in the top half of the draw). Fast fact -- Nadal's No. 6 seeding is his lowest in a Grand Slam tournament since 2005. Northern California connection -- Sam Querrey, a San Francisco native and former Sacramento Capital in World TeamTennis, and Johnson defeated Martin Klizan of Slovakia and Philipp Oswald of Austria 2-6, 7-6 (5), 6-2 in the first round. ... Ex-Stanford standout Scott Lipsky of Irvine and Treat Huey of the Philippines lost to 13th-seeded Marin Draganja of Croatia and Henri Kontinen of Finland 2-6, 6-1, 6-4. Quote -- French wild card Maxime Hamou on winner Jerzy Janowicz's exaggerated handshake and finger-pointing after the match: "I found it was a little edgy on his part. There is nothing else I have to say at this point. I think a lot of players know him; I did not know him. I know him now." Match of the day -- Sloane Stephens dispatched fellow American Venus Williams, seeded 15th, 7-6 (5), 6-1 in the first round. It was Williams' second opening-round loss in three years at Roland Garros. Stephens has plunged from a career-high No. 11 in the world in 2013 to 40th. Upset of the day -- Teymuraz Gabashvili of Russia surprised 11th-seeded Feliciano Lopez of Spain 6-3, 7-6 (9), 6-3. Lopez, ranked a career-high No. 12 at 33 years old, suffered is 10th first-round loss in 15 French Open appearances. Notable -- Annika Beck of Germany eliminated 14th-seeded Agnieszka Radwanska, the 2012 Wimbledon runner-up, 6-2, 3-6, 6-1. ... No. 2 seed and defending champion Maria Sharapova, suffering from a cold, coughed repeatedly during her 6-2, 6-4 win over Kaia Kanepi. Men's seeded winners -- No. 3 Andy Murray, No. 4 Tomas Berdych, No. 12 Gilles Simon, No. 13 Gael Monfils, No. 17 David Goffin, No. 18 Tommy Robredo, No. 21 Pablo Cuevas, No. 27 Bernard Tomic, No. 28 Fabio Fognini, No. 29 Nick Kyrgios, No. 31 Viktor Troicki, No. 32 Fernando Verdasco. Men's seeded losers -- No. 11 Lopez, No. 30 Adrian Mannarino. Women's seeded winners -- No. 2 Sharapova, No. 8 Carla Suarez Navarro, No. 11 Angelique Kerber, No. 12 Karolina Pliskova, No. 17 Sara Errani, No. 19 Elina Svitolina, No. 26 Sam Stosur, No. 27 Victoria Azarenka, No. 29 Alize Cornet, No. 30 Irina-Camelia "Ain't Too Proud To" Begu. Women's seeded losers -- No. 14 Agnieszka Radwanska, No. 15 Venus Williams, No. 22 Barbora Strycova. U.S. men's winners -- None. U.S. men's losers -- Sam Querrey, Donald Young, Frances Tiafoe (17 years old). U.S. women's winner -- Sloane Stephens. U.S. women's losers -- No. 15 Venus Williams, Madison Brengle, Bethanie Mattek-Sands, Alison Riske, Nicole Gibbs. Fast fact -- Stephens joined Lindsay Davenport as the only Americans to have beaten Serena and Venus Williams in a Grand Slam tournament, the Associated Press reported. Stephens knocked off Serena en route to the semifinals of the 2013 Australian Open. Northern California connection -- All three players with NorCal ties in action today lost. Querrey, a San Francisco native, fell to 18-year-old rising star Borna Coric of Croatia 7-6 (8), 6-3, 0-6, 6-3. Gibbs, a former Stanford star making her French Open debut, succumbed to Alexandra Dulgheru of Romania 6-3, 6-1. And Jarmila Gajdosova of the Sacramento-based California Dream in World TeamTennis dropped a 2-6, 6-3, 6-2 decision to French wild card Amandine Hesse. ... Stephens is coached by Nick Saviano, a two-time All-American at Stanford in the 1970s. Quote -- Saviano on Stephens, according to the AP: "I want her to play with a sense of joy ... and play everything as well as she can, relentlessly, and not be concerned with the result. Let the result take care of itself. And she did a good job of that today." This is getting a bit old for Stanford and Cal women. Today in Waco, Texas, they fell to 0-3 in NCAA singles or doubles finals in the past two years. In an all-sophomore singles match, second-seeded Carol Zhao of Stanford lost to seventh-seeded Jamie Loeb of North Carolina 6-2, 4-6, 6-1. Then No. 5-8 seeds Klara Fabikova and Zsofi Susanyi of Cal dropped a 6-2, 6-7 (5), 6-3 decision to top seeds and defending champions Maya Jansen and Erin Routliffe of Alabama. In last year's singles final in Athens, Ga., Cal's Lynn Chi lost to Danielle Collins of Virginia. Until then, Stanford or Cal women had won the NCAA singles or doubles title for five straight years. In fact, in 2011 and 2012, they swept the crowns. Zhao, whose winning streak was snapped at 15 matches, attempted to become the third Cardinal in four years to earn the NCAA women's singles title. Nicole Gibbs, who lost in her French Open debut today, triumphed in 2012 and 2013. Danielle Collins of Virginia prevailed in 2014. Both Zhao and Loeb have had success playing as amateurs in professional tournaments. The 5-foot-5 (1.65-meter) Zhao, from Canada, is ranked No. 289 in the world. The 5-foot-6 (1.68-meter) Loeb, from Ossining, N.Y., reached the quarterfinals in the $50,000 Sacramento Challenger last July. Jansen and Routliffe became the first women to repeat as NCAA doubles champions since Amanda Augustus and Amy Jensen of Cal in 1998 and 1999. Augustus is now Cal's coach. Stanford's Hilary Barte (2011 and 2012) and Mallory Burdette (2012 and 2013) each won back-to-back NCAA doubles crowns but with different partners. Fabikova, a junior from the Czech Republic, and Susanyi, a senior from Hungary, tried to become the first Bears to win the doubles title since Mari Andersson and Jana Juricova in 2009. Juricova also won the 2011 singles crown at Stanford. In today's men's singles final, eighth-seeded Ryan Shane of NCAA champion Virginia used his massive power to beat No. 7 Noah Rubin of Wake Forest 3-6, 7-6 (4), 6-1. Shane, a 6-foot-4 (1.94-meter) junior from Falls Church, Va., avenged a 7-6 (5), 6-3 loss to the 5-foot-9 (1.75-meter) Rubin in last month's Atlantic Coast Conference final. Rubin would have been just the second player to win the Wimbledon juniors, USTA Boys 18 National Championships and NCAAs, and he would have been the first freshman to accomplish the feat. Only UCLA men's coach Billy Martin has won all three titles. Both singles finals were moved indoors because of rain. As American NCAA champs, Loeb and Shane will receive wild cards into the main draw of the U.S. Open in August. Loeb, like Rubin a product of the Manhattan-based John McEnroe Tennis Academy, lives only 30 minutes from the USTA National Tennis Center in Flushing Meadows, N.Y. In an all-Big 12 Conference men's doubles final, Lloyd Glasspool and Soren Hess-Olesen of Texas defeated Hugo Dojas and Felipe Soares of Texas Tech 6-1, 3-6, 6-3. Both teams were unseeded. It turns out that Carol Zhao plays pretty well from behind, too. The Stanford star, seeded second, reeled off the last nine games in her 2-6, 6-4, 6-0 victory over No. 9-16 Josie Kuhlman of Florida today in Waco, Texas, to reach the NCAA singles final. Zhao lost only two games in each of her first three matches and won her quarterfinal in straight sets. Zhao, a 5-foot-5 (1.65-meter) sophomore from Canada, will play seventh-seeded Jamie Loeb of North Carolina on Monday at 10 a.m. PDT. Loeb, a 5-foot-6 (1.68-meter) sophomore from Ossining, N.Y., beat No. 9-16 Stephanie Wagner of Miami 4-6, 6-4, 6-2. Zhao, ranked No. 289 in the world, will attempt to become the third Cardinal in four years to win the NCAA women's singles title. Nicole Gibbs triumphed in 2012 and 2013; Danielle Collins of Virginia prevailed in 2014. Loeb, who eliminated Collins in this year's quarterfinals, reached the quarters in the $50,000 Sacramento Challenger last July. San Francisco Bay Area schools could sweep the singles and doubles titles. No. 5-8 seeds Klara Fabikova and Zsofi Susanyi of Cal topped No. 5-8 Brooke Austin and Kourtney Keegan of Florida 3-6, 6-4, 6-4 to reach the final. It's the second straight year that a Cal woman has reached an NCAA final. Lynn Chi lost to Collins last year. Fabikova, a junior from the Czech Republic, and Susanyi, a senior from Hungary, will face No. 1 seeds and defending champions Maya Jansen and Erin Routliffe of Alabama following the women's singles final. Jansen and Routliffe eliminated unseeded Caroline Doyle and Ellen Tsay of Stanford 5-7, 6-3, 6-0. Like Zhao, Routliffe lives in Ontario, Canada. Doyle is from San Francisco and Tsay from Pleasanton. Fabikova and Susanyi will attempt to become the first Bears to win the doubles title since Mari Andersson and Jana Juricova in 2009. Juricova also won the 2011 singles crown at Stanford. In the men's singles final, seventh-seeded Noah Rubin of Wake Forest will meet eighth-seeded Ryan Shane of NCAA champion Virginia in a rematch of last month's Atlantic Coast Conference final. Rubin, a freshman who won the Wimbledon junior boys title last year, beat unseeded Thai-Son Kwiatkowski of Virginia 6-4, 6-4. Shane, a junior, outclassed No. 9-16 Quentin Monaghan of Notre Dame 6-4, 6-1. Rubin, a product of the Manhattan-based John McEnroe Tennis Academy along with Loeb, defeated Shane 7-6 (5), 6-3 in the ACC final. In an all-Big 12 Conference men's doubles final, Lloyd Glasspool and Soren Hess-Olesen of Texas will face Hugo Dojas and Felipe Soares of Texas Tech. Both teams are unseeded. in five sets in the first round of the French Open. Match of the day -- Steve Johnson of Redondo Beach in the Los Angeles area ousted 26th-seeded Guillermo Garcia-Lopez of Spain 6-3, 6-3, 6-7 (1), 3-6, 6-3. Upset of the day -- No. 24 Peng Shuai, a semifinalist at last year's U.S. Open, retired with a back injury while trailing Polona Hercog of Slovenia 6-0, 2-0.
Notable -- No. 5 Kei Nishikori and No. 8 Stan Wawrinka, both of whom fell in the opening round last year, won in straight sets. Men's seeded winners -- No. 2 Roger Federer, No. 5 Kei Nishikori, No. 8 Stan Wawrinka, No. 14 Jo-Wilfried Tsonga, No. 19 Roberto Bautista Agut, No. 22 Philipp Kohlschreiber, No. 24 Ernests Gulbis. Men's seeded losers -- No. 25 Ivo Karlovic, No. 26 Guillermo Garcia-Lopez. Women's seeded winners -- No. 3 Simona Halep, No. 7 Ana Ivanovic, No. 9 Ekaterina Makarova, No. 13 Lucie Safarova, No. 21 Garbine Muguruza, No. 28 Flavia Pennetta. Women's seeded losers -- No. 24 Peng Shuai, No. 31 Caroline Garcia. Stars and stripes -- Americans went 1-2. In addition to Johnson's victory, 19-year-old wild card Louisa Chirico lost to ninth-seeded Ekaterina Makarova of Russia 6-4, 6-2, and 5-foot-2 (1.57-meter) Lauren Davis fell to Mirjana Lucic-Baroni of Croatia 6-3, 3-6, 6-3. Fast fact -- Six-foot-11 (2.11-meter) Ivo Karlovic, 36, of Croatia lost in the first round at Roland Garros for the fifth time in his last six appearances. He fell to Cyprus' Marcos Baghdatis, the 2006 Australian Open runner-up, 7-6 (5), 6-4, 6-4. Northern California connection -- Two Aptos Challenger champions won: Johnson (2012) and Baghdatis (2014). Quote -- Federer, on a spectator who got on Center Court to snap selfies with him: "That should never happen on the Philippe Chatrier Court. I'm not happy about it. Obviously not (for) one second (am I) happy about it." The French Open began today in Paris and continues through June 7. Seedings are in parentheses. Why he'll win -- Djokovic has won 22 straight matches and is in his prime. The Serb turned 28 on Friday. Why he won't -- He's 0-6 against Rafael Nadal at Roland Garros. Why he'll win -- Federer has won a record 17 Grand Slam singles titles, including the 2009 French Open, and he has a favorable draw. Why he won't -- At almost 34 years old, the Swiss star no longer has the stamina to win seven best-of-five-set matches. Why he'll win -- The two-time Grand Slam champion is 10-0 since marrying longtime girlfriend Kim Sears, including his first two ATP titles on clay (Munich and Madrid). He beat three top-six players -- No. 6 Milos Raonic, No. 5 Kei Nishikori and No. 4 Nadal in straight sets -- in the last three rounds in Madrid. Why he won't -- The 28-year-old Scot has never reached the final at Roland Garros. NorCal connection -- Murray won the now-defunct SAP Open in San Jose in 2006 at 18 years old and repeated in 2007. He also won the Aptos Challenger in 2005. Why he'll win -- The 29-year-old Czech took Djokovic to 6-3 in the third set of the Monte Carlo final on clay in April. Why he won't -- Clay is Berdych's worst surface; his best showing at Roland Garros is the semifinals in 2010. NorCal connection -- Berdych made the quarterfinals of the 2009 SAP Open as the fifth seed in his only appearance in San Jose. Why he'll win -- The 25-year-old Japanese reached his first Grand Slam final last September in the U.S. Open on hardcourts and won Barcelona on clay in April. His coach, Michael Chang, became the youngest man to win a Grand Slam singles title when he captured the 1989 French Open at 17. Like Nishikori, Chang was undersized. Why he won't -- Nishikori hasn't advanced past the fourth round in four appearances at Roland Garros. NorCal connection -- Nishikori played in the SAP Open three times, losing in the second round in 2008, 2009 and 2011. Brad Gilbert of San Rafael coached Nishikori in 2011. Why he'll win -- Nadal has won nine French Open titles, including the last five. Why he won't -- The 28-year-old Spaniard has struggled -- by his lofty standards -- after having health problems in the last six months of 2014. Also, he has a brutal draw. Why he'll win -- Wawrinka won last year's Australian Open for his first Grand Slam title, he beat Nadal in the quarterfinals of the recent Italian Open, and he reached the French Open quarters in 2013. Why he won't -- He lost in the first round at Roland Garros last year. Djokovic will become the eighth man to complete a career Grand Slam and continue his bid for the first calendar-year Grand Slam since Rod Laver accomplished the feat for the second time in 1969. Classic at Stanford, seeks her 20th Grand Slam singles crown. Why she'll win -- Williams' has won 19 Grand Slam singles titles, including two in the French Open (2002 and 2013), and she has plenty of motivation. Time is short as she tries to move up from third on the Grand Slam career list behind Margaret Court (24) and Steffi Graf (22), and she lost to Spanish upstart Garbine Muguruza 6-2, 6-2 in the second round at Roland Garros last year. Why she won't -- Clay reduces Williams' power, she'll be 34 in September, and the right-hander withdrew from her second-round match in the Italian Open two weeks ago with a right elbow injury (although she says it feels much better). Why she'll win -- The 28-year-old Russian has reached the last three finals at Roland Garros, winning last year and in 2012, and she's coming off her third Italian Open crown. Why she won't -- Sharapova has a tough draw, and she's 2-17 lifetime against Williams (0-4 on clay). Why she'll win -- The 23-year-old Romanian reached her first Grand Slam final in last year's French Open, losing 6-4 in the third set to Sharapova, and is ready to take the next step. Why she won't -- Halep will fold under the pressure of defending her ranking points from last year's runner-up finish. Why she'll win -- If the 6-foot-2 (1.88-meter) Sharapova can do it (twice), why not the 6-foot (1.82-meter) left-hander and two-time Wimbledon champion? The 25-year-old Czech won Madrid on clay this month, routing Williams 6-2, 6-3 in the semifinals. Why she won't -- Kvitova has lost in the third round of the French Open the past two years. Why she'll win -- The 24-year-old Dane reached her first Grand Slam final in five years at the U.S. Open last September, losing to close friend Williams, and her consistency is well-suited to clay. Why she won't -- Wozniacki has advanced to the quarterfinals at Roland Garros only once, in 2010, in eight appearances. She lost to Yanina Wickmayer of Belgium in the first round last year. Why she'll win -- The 26-year-old Spaniard beat top-five players Kvitova and Halep to reach the Italian Open final, in which she extended Sharapova to three sets. Why she won't -- Suarez Navarro is 0-3 in finals this year and has never reached a Grand Slam semifinal. NorCal connection -- She won the doubles title in last year's Bank of the West Classic with Muguruza. 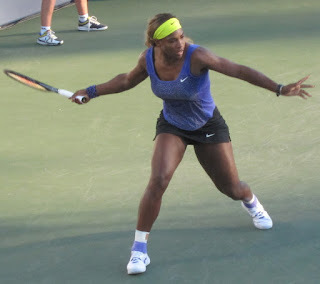 Provided her elbow holds up, Williams will win her third straight Grand Slam singles title and 20th overall. Suddenly, Stanford's Carol Zhao is favored to win the NCAA women's singles title. On a day when top-seeded Robin Anderson of UCLA and defending champion Danielle Collins of Virginia lost, the second-seeded Zhao reached the semifinals with another straight-set victory. Unlike in her first three matches, Zhao was tested. The 5-foot-5 (1.65-meter) sophomore from Canada topped unseeded Chanelle Van Nguyen of UCLA 6-4, 7-5 on Saturday in Waco, Texas, after dropping only two games in each of her previous contests. Zhao, ranked No. 289 in the world, will meet No. 9-16 seed Josie Kuhlman of Florida. Kuhlman beat unseeded Sinead Lohan of Miami 6-3, 6-4. In the top half of the draw, No. 9-16 Stephanie Wagner of Miami ousted Anderson 3-6, 6-4, 6-2, and seventh-seeded Jamie Loeb of North Carolina eliminated No. 9-16 Collins, the defending champ, 6-3, 1-6, 6-4. Stanford and Cal each have one team in the doubles semifinals, even though second-seeded Taylor Davidson and Zhao lost to No. 5-8 Brooke Austin and Kourtney Keegan of Florida 6-0, 1-6, 6-4. Austin and Keegan will face Cal's Klara Fabikova and Zsofi Susanyi, a No. 5-8 team that dismissed unseeded Ashleigh Antal and Astra Sharma of NCAA champion Vanderbilt 6-2, 6-2. In the other semifinal, unseeded Caroline Doyle and Ellen Tsay of Stanford will play No. 1 seeds and defending champions Maya Jansen and Erin Routliffe of Alabama. Like Zhao, Routliffe is from Ontario, Canada. Doyle, a sophomore from San Francisco, and Tsay, a senior from Pleasanton, upset fourth-seeded Beatrice Gumulya and Jessy Rompies of Clemson 4-6, 6-4, 6-4. Meanwhile, two men from NCAA champion Virginia reached the singles semifinals. Eighth-seeded Ryan Shane will play No. 9-16 Quentin Monaghan of Notre Dame, and unseeded Thai-Son Kwiatkowski will take on seventh-seeded Noah Rubin of Wake Forest. Rubin, last year's Wimbledon junior boys singles champion, and Loeb, a Wimbledon junior girls quarterfinalist in 2013, are products of the Manhattan-based John McEnroe Tennis Academy. As in women's singles, the top seeds and defending champions lost in separate men's doubles quarterfinals. No. 1 Austin Smith and Ben Wagland of Georgia fell to unseeded Hugo Dojas and Felipe Soares of Texas Tech 6-2, 6-3. Fourth-seeded Mikelis Libietis and Hunter Reese, the 2014 winners from Tennessee, succumbed to No. 5-8 Diego Galeano and Julian Lenz of host Baylor 6-7 (5), 6-3, 6-4. Three teams in the men's doubles semifinals are from Texas schools, although none of the six players are American. Galeano (Paraguay) and Lenz (Germany) will face unseeded Lloyd Glasspool (England) and Soren Hess-Olesen (Denmark) of Texas, and unseeded Dojas and Soares (both Brazil) will meet unseeded Harry Jadun and John Patrick Mullane of Michigan State. Oddly enough, Jadun and Mullane are from Michigan. First round (men/women), ESPN2, 2-7 a.m. (live). First round (men/women), Tennis Channel, 7 a.m.-12:30 p.m. (live). First round (men/women), NBC, 10 a.m.-12:30 p.m. (live). Highlights, Tennis Channel, 4-7 p.m., 7-10 p.m. (repeat), 10 p.m.-1 a.m. Monday (repeat). First round (men/women), NBC, 9 a.m.-noon (live). Highlights, Tennis Channel, 4-7 p.m., 7-10 p.m. (repeat), 10 p.m.-1 a.m. Tuesday (repeat). Highlights, Tennis Channel, 4-7 p.m., 7-10 p.m. (repeat), 10 p.m.-1 a.m. Wednesday (repeat). Second round (men/women), ESPN2, 2-7 a.m. (live). Second round (men/women), Tennis Channel, 7 a.m.-12:30 p.m. (live). Highlights, Tennis Channel, 4-7 p.m., 7-10 p.m. (repeat), 10 p.m.-1 a.m. Thursday (repeat). Highlights, Tennis Channel, 4-7 p.m., 7-10 p.m. (repeat), 10 p.m.-1 a.m. Friday (repeat). Third round (men/women), ESPN2, 2-7 a.m. (live). Third round (men/women), Tennis Channel, 7 a.m.-12:30 p.m. (live). Highlights, Tennis Channel, 4-7 p.m., 7-10 p.m. (repeat), 10 p.m.-1 a.m. Saturday (repeat). Third round (men/women),Tennis Channel, 2-9 a.m. (live). Third round (men/women), NBC, 9 a.m.-noon (live). Highlights, Tennis Channel, noon-3 p.m., 3-6 p.m. (repeat), 6-9 p.m. (repeat), 9 p.m.-midnight. Fourth round (men/women), Tennis Channel, 2-10 a.m. (live). Fourth round (men/women), NBC, 9 a.m.-noon (live). Fourth round (men/women), ESPN2, 2-10 a.m. (live). Fourth round (men/women), Tennis Channel, 7 a.m.-12:30 p.m. (live). Quarterfinals (men/women), Tennis Channel, 5-10 a.m. (live). Quarterfinals (men/women), ESPN2, 10 a.m.-12:30 p.m. (live). Quarterfinals (men/women), ESPN2, 5-10 a.m. (live). Quarterfinals (men/women), Tennis Channel, 10 a.m.-4 p.m. (repeat). Mixed doubles final, Tennis Channel, 3-6 a.m. (live). Semifinals (women), ESPN2, 6-11 a.m. (live). Semifinals (men/women), NBC, 8-11 a.m. (live). Semifinals (women), Tennis Channel, 11 a.m.-4 p.m. (live/repeat). Highlights, Tennis Channel, 4-8:30 p.m., 8:30 p.m.-1 a.m. Friday (repeat). Semifinals (men), Tennis Channel, 4-8 a.m. (live). Semifinals (men), NBC, 11 a.m.-2 p.m. (delay). Highlights, Tennis Channel, 2 p.m.-4 a.m. Saturday (repeat). Final (women), NBC, 6-10 a.m. (live). Final (women), Tennis Channel, 6-8 p.m. (repeat). Doubles final (men), Tennis Channel, 8-9:30 p.m. (delay). Final (men), NBC, 6-11 a.m. (live). Final (men), Tennis Channel, time TBA (repeat). Doubles final (women), Tennis Channel, time TBA (delay). The Stanford women had a great day in the NCAA Singles and Doubles Championships. The Cal women, not so much. Stanford's Carol Zhao, seeded second in singles, reached the singles quarterfinals with another dominating victory on Friday in Waco, Texas, and the Cardinal has two of the remaining eight doubles teams. Meanwhile, Cal's only remaining representatives are No. 5-8 doubles seeds Klara Fabikova and Zsofi Susanyi. Most notably, No. 4 singles seed Maegan Manasse lost to No. 9-16 seed Josie Kuhlman of Florida 4-6, 6-0, 6-1. Zhao, a sophomore from Canada, lost only two games in singles for the third consecutive match. She whipped Susanyi, a senior from Hungary who advanced to the NCAA singles semifinals as a freshman, 6-2, 6-0. Zhao will face unseeded Chanelle Van Nguyen, a UCLA senior who reached the quarterfinals for the second consecutive year. The other quarterfinal matchups are top-seeded Robin Anderson of UCLA against No. 9-16 Stephanie Wagner of Miami, No. 7 Jamie Loeb of North Carolina vs. No. 9-16 and defending champion Danielle Collins of Virginia, and Kuhlman against unseeded Sinead Lohan of Miami. Collins, who won a set against world No. 2 Simona Halep in the first round of the U.S. Open last August, defeated UCLA's Jennifer Brady, ranked No. 209 in the world, 6-1, 7-5. Advancing to the doubles quarterfinals were Stanford's Taylor Davidson and Zhao, the second seeds, and Caroline Doyle and Ellen Tsay. Doyle, a sophomore from San Francisco, and Tsay, a senior from Pleasanton, outlasted No. 5-8 seeds Manasse and Denise Starr 6-4, 1-6, 6-4. Three more seeds fell in men's singles: No. 5 Sebastian Stiefelmeyer of Louisville and No. 9-16s Mikelis Libietis of Tennessee and Yannick Hanfmann of USC. The highest remaining seed is No. 7 Noah Rubin, a Wake Forest freshman who won the Wimbledon junior boys singles title last year. Columbia's Winston Lin, who upset Stiefelmeyer 7-5, 6-4, will meet Thai-Son Kwiatkowski of Virginia in the quarterfinals. Also, Rubin will face unseeded Jared Hiltzik of Illinois, No. 9-16 Quentin Monaghan of Notre Dame will play unseeded Cameron Norrie of Texas Christian, and No. 8 Ryan Shane of Virginia will take on Felipe Soares of Texas Tech. sensation Borna Coric of Croatia in the first round. Friday's French Open draw did Sam Querrey and Nicole Gibbs no favors. It was kinder to Jarmila Gajdosova, but she has health issues. The year's second Grand Slam tournament begins Sunday in Paris (2 a.m. PDT on ESPN2 and 10 a.m. on NBC). Querrey, a San Francisco native and former Sacramento Capital in World TeamTennis, is scheduled to play teenage sensation Borna Coric of Croatia in the first round. Gibbs, a former Stanford star, will face Alexandra Dulgheru of Romania, and Australia's Gajdosova of the Sacramento-based California Dream in WTT will meet French wild card Amandine Hesse. At No. 53, the 18-year-old Coric is the top-ranked male teenager in the world and the second-youngest player in the top 100 behind No. 85 Alexander Zverev, an 18-year-old German. Coric, who will debut in the clay-court French Open, already owns victories over Rafael Nadal (indoors) and Andy Murray (outdoor hardcourt). The 27-year-old Querrey, ranked 38th, is only 4-8 in eight French Open appearances. His best result was the third round in 2013. The winner likely will play 18th-seeded Tommy Robredo, a 33-year-old Spaniard and five-time quarterfinalist at Roland Garros, in the second round. Dulgheru, ranked 50th, reached the quarterfinals of the Italian Open this month as a qualifier. She knocked off 14th-ranked Lucie Safarova in the second round and No. 8 Ekaterina Makarova in the third round before falling to No. 2 and countrywoman Simona Halep. Gibbs, ranked 97th, will make her French Open debut. The two-time NCAA singles champion, 22, prefers hardcourts. Hesse is ranked only No. 261 but will have the crowd behind her. Gajdosova, who reached the round of 16 at Roland Garros in 2010, withdrew from Stasbourg last week with a shoulder injury and undisclosed illness. Meanwhile, only one of the 16 male and 12 female French Open qualifiers is American. Alexa Glatch will take on Anna-Lena Friedsam of Germany in the first round, with the winner likely to play top-ranked Serena Williams. Americans Jared Donaldson, 18, and Jessica Pegula, 21, lost in the final round of qualifying. Two women from Cal and one from Stanford reached the round of 16 on Thursday in the NCAA Singles Championships in Waco, Texas. Advancing on a chilly day, in contrast to Wednesday's heat and humidity, were fourth-seeded Maegan Manasse and unseeded Zsofi Susanyi of the Bears and second-seeded Carol Zhao of the Cardinal. Falling in the second round were No. 9-16 seed Giuliana Olmos of USC and Fremont and unseeded Caroline Doyle of Stanford and San Francisco. Manasse eliminated Alabama's Erin Routliffe, the defending champion in doubles with Maya Jansen, 4-6, 6-0, 6-1. Susanyi, a semifinalist as a freshman, upset No. 9-16 seed Julia Jones of Mississippi 6-4, 1-6, 6-4. Susanyi, a senior from Hungary, became an All-American for the fifth time (three in singles and two in doubles) by reaching the round of 16 as an unseeded player. All seeds automatically earn All-America status. Susanyi will face Zhao, who crushed Sophie Watts of Fresno State 6-0, 6-2. Zhao, a sophomore from Canada, has lost only four games in two matches. Unseeded Chanelle Van Nguyen, a 2014 quarterfinalist from UCLA, demolished sixth-seeded Julia Elbaba, the 2014 National Indoor champion from Virginia, 6-2, 6-0. Olmos lost to Natalie Beazant of Rice 6-2, 6-4, and Doyle succumbed to top-seeded Robin Anderson of UCLA by the same score. Meanwhile, the top two men's seeds lost. Top-seeded Axel Alvarez Llamas of Oklahoma fell to Tony Lupieri of Baylor 6-4, 6-4, and No. 2 Julian Lenz of host Baylor was ousted by Jonny Wang, who walked on at USC, 6-2, 1-6, 7-5. Also, Cameron Norrie of Texas Christian surprised No. 6 Soren Hess-Olesen, a 2014 semifinalist from Texas, 5-7, 6-3, 6-3. After two rounds, No. 5 Sebastian Stiefelmeyer of Louisville is the highest remaining seed. All four women's doubles teams from Cal and Stanford reached the second round. Moving on were No. 2 Taylor Davidson-Zhao, Doyle-Ellen Tsay (Pleasanton), No. 5-8 Manasse-Starr and No. 5-8 Klara Fabikova-Susanyi. Also advancing was the USC team of Olmos and Zoe Scandalis. In men's doubles, No. 5-8 seeds John Morrissey and Robert Stineman of Stanford lost to Marko Krickovic and Lukas Ollert of Auburn 7-5, 6-3. And UCLA's Mackenzie McDonald of Piedmont and Martin Redlicki fell to Boris Arias and Jordan Daigle of LSU 4-6, 7-6 (1), 6-4. Second-seeded Yannick Hanfmann and Roberto Quiroz of USC lost to Lloyd Glasspool and Hess-Olesen of Texas 6-3, 1-6, 6-2, and No. 3 Luca Corinteli and Ryan Shane of NCAA champion Virginia dropped a 6-1, 6-7 (4), 7-5 decision to Harry Jadun and John Patrick Mullane of Michigan State. Maria Sanchez from Modesto lost to third-seeded Sesil Karatantcheva of Bulgaria 6-3, 6-7 (5), 6-1 today in the second round of French Open qualifying in Paris. Sanchez, a 25-year-old USC graduate, was seeking her first berth in the singles main draw at Roland Garros. In her only other appearance, she also lost in the second round of qualifying in 2013. Sanchez has not played in the doubles main draw of the French Open but could this year. She is ranked No. 89 in doubles and No. 187 in singles. Karatantcheva reached the French Open quarterfinals 10 years ago at age 15. Later in 2005, she was suspended for two years after testing positive twice for nandrolone. Also falling today were Americans Grace Min and Anna Tatishvili. That leaves Alexa Glatch and Jessica Pegula, whose billionaire father owns the NFL's Buffalo Bills and the NHL's Buffalo Sabres, as the lone U.S. women in the final round of qualifying. Only one U.S. man, 18-year-old Jared Donaldson, advanced to the last round. Donaldson, who has lost only three games in two matches, will face 27th-seeded Nikoloz Basilashvili of Georgia on Friday. Basilashvili eliminated American Bjorn Fratangelo 6-1, 6-7 (9), 6-3. Fratangelo, who's named after Bjorn Borg, in 2011 joined John McEnroe (1977) as the only Americans in the Open era to win the French Open junior boys title. round of the NCAA Singles Championships in Waco, Texas. Not only was Mackenzie McDonald of Piedmont upset in the first round of the NCAA Singles Championships, it wasn't even close. The third-seeded McDonald, a UCLA sophomore and 2014 quarterfinalist, lost to Texas' Lloyd Glasspool, a senior from England, 6-0, 6-2 today in heat and humidity in Waco, Texas. The 20-year-old McDonald, only 5-foot-10 (1.78 meters) and 145 pounds (66 kilograms), has had success playing as an amateur on the pro tour. He reached the semifinals of the $50,000 Winnetka (Ill.) Challenger as a qualifier last summer, ousting Sam Groth in the first round. Groth is credited with the fastest serve in history, 163.7 mph (263.4 kph) in the 2012 Busan (South Korea) Challenger, and is ranked No. 73 in the world. Also, McDonald became the only unranked teenager to qualify for an ATP World Tour Masters 1000 tournament, the highest men's level besides the Grand Slams, at Cincinnati in 2013. In the first round of qualifying, he knocked out then-No. 79 Nicolas Mahut of France. In other NCAA first-round matches, the only two men from Northern California schools lost to seeds. Cal's Andre Goransson fell to No. 5 Sebastian Stiefelmeyer of Louisville 6-4, 6-3, and Stanford's Tom Fawcett succumbed to No. 7 Noah Rubin of Wake Forest 7-5, 6-4 in an all-freshman encounter. Rubin, a product of the Manhattan-based John McEnroe Tennis Academy, won the Wimbledon junior boys singles title last summer. Top-seeded Axel Alvarez Llamas, physically and emotionally drained after his Oklahoma Sooners lost to Virginia in Tuesday's team final, saved two match points in a 3-6, 7-6 (3), 6-1 victory over Nik Scholtz of Mississippi. On the women's side, two players from Stanford and two from Cal advanced to the second round. Second-seeded Carol Zhao of Stanford routed Paige Hourigan of Georgia Tech 6-1, 6-1, and the Cardinal's Caroline Doyle of San Francisco took out Despoina Vogasari of Houston 6-4, 6-4. Doyle will face top-seeded Robin Anderson of UCLA. Fourth-seeded Maegan Manasse of Cal topped Cindy Chala of Virginia Commonwealth 4-6, 6-4, 6-1, and the Bears' Zsofi Susanyi, a semifinalist as a freshman in 2012, outclassed Yuliya Lysa of Arkansas 6-3, 6-2. Also advancing were No. 9-16 seed Giuliana Olmos of USC and Fremont, and Sophie Watts of Fresno State. Falling were Stanford's Taylor Davidson and Cal's Klara Fabikova and Denise Starr. Davidson lost to No. 9-16 seed and defending champion Danielle Collins of Virginia 6-3, 6-3. Fabikova dropped a 6-3, 6-4 decision to eighth-seeded Sydney Campbell of Vanderbilt, which won its first NCAA title on Tuesday, and Starr was eliminated by Ronit Yurovsky of Michigan 1-6, 7-5, 6-2. UCLA's Jennifer Brady, who won the $25,000 Redding Challenger last summer, upset third-seeded Brooke Austin of Florida 7-6 (3), 6-3. Meanwhile, Sinead Lohan of Miami suprised No. 5 Lauren Herring of Georgia 6-1, 6-4. Doubles play will begin on Thursday. Davidson and Zhao are seeded second, and Manasse-Starr and Fabikova-Susanyi are each seeded 5-8. Doyle-Ellen Tsay (Pleasanton) and Olmos-Zoe Scandalis are unseeded. Stanford's John Morrissey and Robert Stineman are seeded 5-8 in men's doubles, and UCLA's McDonald and Martin Redlicki are unseeded. Veteran Maria Sanchez from Modesto won today in the first round of French Open qualifying, but 16-year-old sensation CiCi Bellis of Atherton fell in her women's debut at Roland Garros. Sanchez, a 25-year-old USC graduate, dominated Risa Ozaki of Japan 6-1, 6-1. Bellis lost to Veronica Cepede Royg of Paraguay 6-4, 6-0. Overall, American women went 5-3. Also winning were Jessica Pegula, whose billionaire father owns the NFL's Buffalo Bills and NHL's Buffalo Sabres; Alexa Glatch; Grace Min; and Anna Tatishvili. Joining Bellis on the sideline were Sachia Vickery and 17-year-old Katerina Stewart. Sanchez is scheduled to face third-seeded Sesil Karatantcheva of Bulgaria on Thursday. Karatantcheva, who eliminated countrywoman Elitsa Kostova 4-6, 6-2, 6-1, reached the French Open quarterfinals 10 years ago at age 15. Later in 2005, she was suspended for two years after testing positive twice for nandrolone. Only two U.S. men, 18-year-old Jared Donaldson and Bjorn Fratangelo, remain alive as they head into their second-round matches on Thursday. Jason Jung lost to 18th-seeded Marco Cecchinato of Italy 7-5, 6-1 in the second round. In 2011, Fratangelo joined John McEnroe (1977) as the only Americans in the Open era to win the French Open junior boys title. Bellis reached last year's junior girls doubles final at Roland Garros with Marketa Vondrousova of the Czech Republic. They lost to Romanians Ioana Ducu and Ioana Rosca 6-1, 5-7 [11-9]. Dennis Novikov cracked the top 200 in the world in doubles for the first time by reaching the semifinals of the $47,250 Heilbronn (Germany) Challenger on indoor clay last week with Alessandro Motti of Italy. Novikov, 21, of San Jose rose from No. 206 to No. 195. The 6-foot-4 (1.93-meter), 200-pound (91-kilogram) Novikov also improved four spots to a career-high No. 185 in singles by advancing to the second round in Heilbronn. Collin Altamirano, 19-year-old Sacramentan -- No. 891 in singles (-4). Mike Bryan, 37-year-old former Stanford star -- Career-high No. 1 in doubles (no change), unranked in singles. Bradley Klahn, 24-year-old former Stanford star -- No. 223 in singles (+3), No. 152 in doubles (no change). Scott Lipsky, 33-year-old former Stanford star -- No. 33 in doubles (-2), unranked in singles. Mackenzie McDonald, 20-year-old Piedmont resident -- No. 539 in singles (-1), No. 564 in doubles (-4). Dennis Novikov, 21-year-old San Jose resident -- Career-high No. 185 in singles (+4), career-high No. 195 in doubles (+11). Aisam-ul-Haq Qureshi, 35-year-old member of Sacramento-based California Dream in World Team Tennis (2015) -- No. 47 in doubles (+1). Sam Querrey, 27-year-old San Francisco native and former Sacramento Capital in World TeamTennis (2012-13) -- No. 38 in singles (-1), No. 61 in doubles (no change). Tennys Sandgren, 23-year-old member of California Dream -- No. 235 in doubles (-1), No. 377 in singles (no change). Matt Seeberger, 30-year-old Los Altos resident -- Career-high No. 241 in doubles (no change). Dmitry Tursunov, 32-year-old resident of Folsom in Sacramento area -- No. 267 in singles (-61), No. 515 in doubles (-10). Kristie Ahn, 22-year-old former Stanford star -- No. 526 in singles (+2), No. 606 in doubles (no change). CiCi Bellis, 16-year-old resident of Atherton in San Francisco Bay Area -- No. 170 in singles (+1). Alexandra Facey, 22-year-old resident of Cameron Park in Sacramento area -- No. 736 in doubles (-1). Kat Facey, 22-year-old resident of Cameron Park in Sacramento area -- No. 736 in doubles (-1). Jarmila Gajdosova, 28-year-old member of California Dream (2015) -- No. 52 in singles (no change), No. 64 in doubles (-5). Anabel Medina Garrigues, 32-year-old member of California Dream (2015) -- No. 40 (-2) in doubles, No. 736 (+2) in singles. Nicole Gibbs, 22-year-old former Stanford star -- No. 97 in singles (no change), No. 999 in doubles (-3). Michaela Gordon, 15-year-old resident of Saratoga in San Francisco Bay Area -- No. 779 in singles (-65). Lejla Hodzic, 29-year-old former Stanford standout -- No. 756 in doubles (-1). Raquel Kops-Jones, 32-year-old San Jose resident and former Cal star -- No. 15 in doubles (no change), No. 794 in singles (+2). Maria Sanchez, 25-year-old Modesto product -- No. 89 in doubles (+1), No. 187 in singles (-15). Allie Will, 24-year-old native of San Mateo in San Francisco Bay Area -- No. 227 in doubles (-5), No. 594 in singles (-12). Carol Zhao, 19-year-old Stanford sophomore -- No. 289 in singles (+3), No. 501 in doubles (no change). Geneva (men), early rounds, 4-10 a.m. (delay). Geneva (men), quarterfinals, 1-3 p.m. (delay). Nurnberg (women), quarterfinals, 3-5 p.m. (delay). Geneva (men), quarterfinals, 4-8 a.m. (delay). Nurnberg (women), quarterfinals, 8-10 a.m. (delay). Geneva (men), semifinals, 1-3 p.m. (delay). Nurnberg (women), semifinals, 3-5 p.m. (delay). Geneva (men), final, 1-3 p.m. (delay). Nurnberg (women), final, 3-5 p.m. (delay). July 14-19 -- $50,000 Stockton Women's Challenger. Aug. 1-9 -- USTA Boys and Girls National Championships, various sites. www.usta.com. Sept. 15-20 -- $25,000 Redding Women's Challenger, Sun Oaks Tennis & Fitness. Qualifying begins Sept. 13. Champions in 2014: Jennifer Brady, Brady/Lauren Embree. Oct. 12-18 -- $50,000 Fairfield Men's Challenger (qualifying begins Oct. 10). Champions in 2014 (Napa): Sam Querrey, Peter Polansky/Adil Shamasdin. Collin Altamirano is building quite an amateur resume. The 19-year-old Sacramentan today added an NCAA team title to his 2013 USTA 18-and-under national championship. He also reached last year's USTA 18-and-under final, losing to Wimbledon junior boys champion Noah Rubin. Altamirano, a freshman, won both of his matches as third-ranked Virginia toppled No. 1 Oklahoma 4-1 in Waco, Texas, for its second NCAA team crown in three years. "I couldn't be more proud of the players," Virginia coach Brian Boland said on virginiasports.com. "They have bought in to being a true team, and the culture was tremendous. It has been a great journey with this group, and I am so glad we could end this season with a championship. There is nothing more special for me than to see a group of young men work hard, come together and do things the right way, and then celebrate in the end." The No. 4 Vanderbilt women (25-6) beat No. 6 UCLA (23-5), the defending champion, 4-2 for their first title. The Virginia men had lost to Oklahoma 4-3 on March 10 in Norman, Okla. Also, the Cavaliers had been 0-2 this season against tournament host Baylor before defeating the No. 2 Bears 4-2 on Monday. Virginia (29-3) became the sixth program in the 70-year history of the NCAA Men's Tennis Championships to win multiple titles. The Cavaliers joined USC (21), Stanford (17), UCLA (16), Georgia (six) and William and Mary (two). Oklahoma (29-3), seeking its first NCAA title, lost in the final for the second consecutive year under coach John Roddick. His younger brother, former world No. 1 Andy Roddick, attended the match. Altamirano and J.C. Aragone clinched the doubles point for Virginia with an 8-5 victory over Axel Alvarez and Jose Salazar 8-5 on Court 3. Altamirano, ranked 77th in singles, later gave the Cavaliers a 2-1 lead by dismissing No. 44 Dane Webb 6-3, 6-3 at the third position. No. 20 Mitchell Frank clinched the title for Virginia with a 7-5, 7-5 victory over No. 7 Andrew Harris on Court 2. Harris won the 2012 Wimbledon and French Open junior boys doubles titles with fellow Australian Nick Kyrgios, now ranked 30th in the world at age 20. Frank, a senior from Annadale, Va., also clinched the Cavaliers' 2013 crown but under much more stress. He saved a championship point in a 0-6, 7-5, 6-4 win over UCLA's Adrien Puget at the third spot. "I said it last time we won a national championship: If there was one player we could have on the court to clinch a match, it would be Mitchell Frank," Boland said. "They guy is a warrior. He loves the game and is incredibly unselfish. To his credit, he really put the team above himself this year." Frank was named the NCAA Men's Championship Most Outstanding Player, and Altamirano made the All-Tournament team at No. 3 singles and No. 3 doubles. Altamirano did not earn a berth in the NCAA 64-player singles or 32-team doubles tournament. Singles play will begin on Wednesday and doubles on Thursday. UCLA's Mackenzie McDonald, a sophomore from Piedmont, is seeded third in men's singles. He will open against Lloyd Glasspool of Texas. Cal's Andre Goransson will face fifth-seeded Sebastian Stiefelmeyer of Louisville, and Stanford's Tom Fawcett will meet the seventh-seeded Rubin of Wake Forest. Stanford's John Morrissey and Robert Stineman are seeded 5-8 in doubles, and UCLA's McDonald and Martin Redlicki are unseeded. Among the women's singles seeds are No. 2 Carol Zhao of Stanford, No. 4 Maegan Manasse of Cal and No. 9-16 Giuliana Olmos of USC and Fremont. The field also includes Stanford's Taylor Davidson and Caroline Doyle; Cal's Klara Fabikova, Zsofi Susanyi and Denise Starr; and Fresno State's Sophie Watts. Davidson and Zhao are seeded second in doubles, and Manasse-Starr and Fabikova-Susanyi are each seeded 5-8. Doyle-Ellen Tsay and Olmos-Zoe Scandalis are unseeded. 1. No. 2 Luca Corinteli and Ryan Shane (Virginia) def. No. 57 Andrew Harris and Alex Ghilea 8-4. 2. No. 42 Mac Styslinger and Thai-Son Kwiatkowski (Virginia) def. Dane Webb and Spencer Papa 8-5. 3. Collin Altamirano and J.C. Aragone (Virginia) def. Axel Alvarez and Jose Salazar 8-5. 1. No. 8 Ryan Shane (Virginia) vs. No. 1 Axel Alvarez 4-6, 5-5, DNF. 2. No. 20 Mitchell Frank (Virginia) def. No. 7 Andrew Harris 7-5, 7-5. 3. No. 77 Collin Altamirano (Virginia) def. No. 44 Dane Webb 6-3, 6-3. 4. No. 19 Thai-Son Kwiatkowski (Virginia) def. No. 103 Alex Ghilea 6-3, 6-4. 5. Spencer Papa (Oklahoma) def. Alexander Ritschard 6-3, 6-2. 6. J.C. Aragone (Virginia) vs. Florin Bragusi 6-7 (5), 4-6, 1-0, DNF. Dennis Novikov had a tough assignment in his French Open debut. The 21-year-old San Jose resident lost to No. 31 seed Facundo Arguello, who grew up playing on clay in Argentina, 4-6, 6-3, 6-2 today in the first round of qualifying in Paris. American men, most of whom have little clay-court experience, won only two of eight completed matches. One of the victories was especially notable. Eighteen-year-old Jared Donaldson, who trained on clay in Buenos Aires for 2 1/2 years, demolished top-seeded Hyeon Chung of South Korea 60 61 in a matchup of top teenage prospects. Donaldson, a semifinalist in the Napa Challenger and quarterfinalist in the Sacramento Challenger last fall, is 18, and Chung is 19. Also, Jason Jung outlasted Andrej Martin of Slovakia 6-7 (2), 6-3, 7-5. Bjorn Fratangelo, a quarterfinalist in the Sacramento and Tiburon Challengers last October, led Alex Bolt of Australia 6-4 when play was suspended for the night. Fratangelo in 2011 joined John McEnroe (1977) as the only Americans in the Open era to win the French Open junior boys title. Besides Novikov, Americans who fell were 16th-seeded Austin Krajicek, 30th-seeded Denis Kudla, Jarmere Jenkins, Mitchell Krueger and Chase Buchanan. Women's qualifying begins on Wednesday. CiCi Bellis, a 16-year-old sensation from Atherton in the San Francisco Bay Area, is scheduled to face Veronica Cepede Royg of Paraguay. Also, Maria Sanchez, 25, from Modesto, is set to play Risa Ozaki of Japan. Bellis, who stunned 12th-seeded Dominika Cibulkova in the first round of last year's U.S. Open, is another exception to the clay-court rule for Americans. She lives near the Burlingame Country Club, which has one of the few clay courts in Northern California, and has trained extensively on clay in Florida. It will be Bellis' first women's match in the French Open. She reached last year's junior girls doubles final at Roland Garros with Marketa Vondrousova of the Czech Republic. They lost to Romanians Ioana Ducu and Ioana Rosca 6-1, 5-7 [11-9].